A big part of every puppy's early education should involve learning how to use its teeth. Mouthing and biting are natural puppy behaviors, but it's important that dogs learn to use their mouth gently. For most of us, when we get a feel of those needle-sharp puppy teeth digging into us, our first instinct is to stop the behavior. Don't! 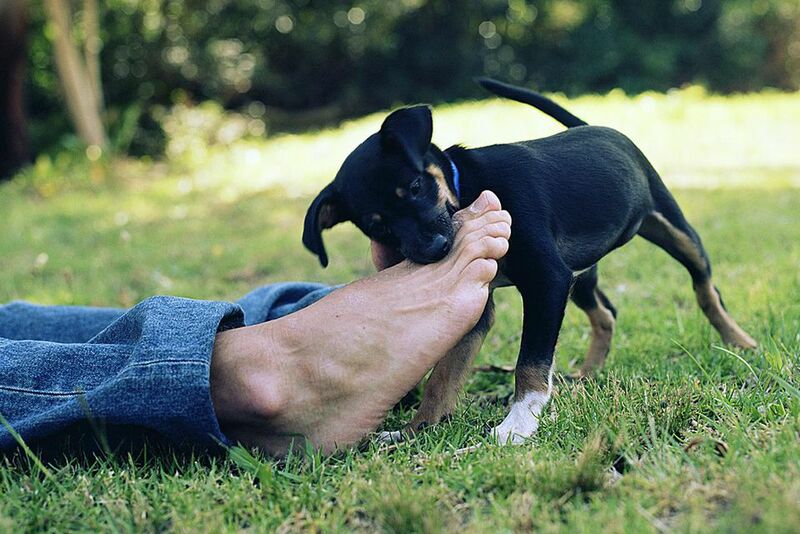 Before you teach your puppy not to bite, you must first teach the pup that when it does bite, the puppy should bite down gently without much pressure. This is called bite inhibition and it should be part of your socialization program for your puppy. It is not particularly difficult to teach but does require a commitment and consistency from the owner. The training is essential and worth it since it will essentially prevent your dog from biting. All dogs have the potential to bite. It's important that dog owners do their best to train dogs so they can prevent dog bites. It's still realistic to plan for the worst. If your puppy grows into an adult and ends up biting someone, you don't want the adult dog to exert a great deal of pressure. Teaching a puppy bite inhibition can mean the difference between a little nip from your dog and a bite that sends the victim to the hospital. The first step of teaching bite inhibition is teaching your puppy to use its mouth softly. If your pup was allowed to stay with its litter until it was 8-weeks-old or older, the puppy's siblings will have already started this lesson. If a puppy nips a littermate too hard, the other puppy usually yelps or stops playing. This lets the pup know that the bite was too hard. When you're playing with your puppy you can follow the example of the littermates (even if they are not there). Allow your pup to nip a little as long as it doesn't really hurt you. When your puppy bites a little too hard, say "ouch" in a firm voice. If the puppy continues to bite hard, you can say "ouch" and then get up and step away from playing for a few minutes. Your puppy will quickly learn that it has to use its mouth gently if the pup wants games with you to continue. The puppy will only learn to use its mouth softly through repetitive and consistent training. Make sure you (and all family members) are aware of the training style and know how to implement it. Then continue to reinforce it daily. Once your puppy is using its mouth gently, it's time to start cutting back on how often your pup is allowed to nip and bite during play. Remember, the cute little bundle of fur in front of you is going to be an adult before you know it, and you, your friends, and family members aren't going to want the puppy using you as a chew toy! Start by teaching your puppy the "leave it" command. You can hold some treats in your hand, give your dog the command, and wait until it backs off a little. Praise the dog and give it a treat. Practice this through several training sessions until your puppy responds to the command every time. Now you can start giving your puppy the "leave it" command any time it starts to mouth your hands. In this way, you can slowly phase out mouthing behaviors entirely, or at least confine it to only those times when you initiate the behavior during playtime. You should now have a dog who never uses its mouth without being invited to play, and when the dog does use its mouth it is done very softly. Again, puppies learn through reinforcement and consistent messages. This is imperative, otherwise training and bite inhibition exercises will not be successful. For the times when the puppy is in a playful mood and you want to redirect the energy (and potential for playful bites) away from you (or your children), have plenty of soft toys around the house. These are perfect for giving the puppy playtime and learning when a harder bite can be appropriate. If you have young children in the house, keep watch of puppy toys versus beloved stuffed animals. To a puppy, they all seem the same. A common mistake is to suppress the biting by punishing the puppy. While this might work as a quick, short-term fix, it is not a solution. Punishment doesn't teach the puppy bite inhibition. If there comes a time when the puppy (or dog) does bite, they will likely bite hard rather than the inhibited biting you were trying to teach them.